Skillfully employing a repertoire of expression greater than his years would suggest to be plausible, an eight year-old Baris dancer mimes the gamut of human expression, including passion, fear, pleasure, rage, tenderness, surprise and love. One moment he prances about with colorful brocade cloth flying in all directions, toes upturned, arms outstretched and fingers fluttering, as if searching for some intangible with all of his senses; the next moment he stands defiant, eyes warning of inner rage. 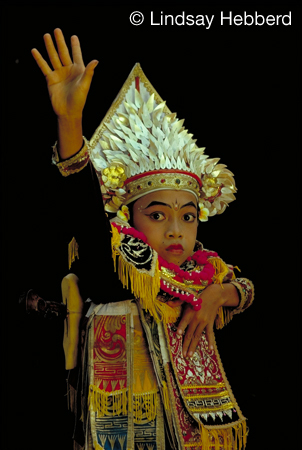 The Baris dancer is a warrior and a symbol of the masculine aspects of Balinese life.